The Eve is more than just an album. It’s a project, a virtual band, an original vision for a new form of international music collaboration. It’s a record, a new album. But even a new international virtual band. Of course, it’s a project, as well. All started from a project by Alessandro Bagagli: the choice to experiment a new form of international collaboration with artists and musicians from all over the world to finalize his new record. This is now possible thanks to new technologies which let artists collaborate from a recording studio to another, all over the world, to share ideas and play instrument parts that end into a finished product as a homogeneous music album. For a release planned for June 7th, 2019, the date of his birthday, the 8th album of his discography had to be different and stunning, not only for the music content but even more for the way the music would be born. So Alessandro has contacted artists from around the world to get them involved in sharing a vision, musical styles and experience to put into his new music and songs. Alessandro got in touch with many musicians in the internet, through social networks and music apps, he explained his project and let his rough songs be listened. Somebody accepted to participate to the project sharing their playing and time to let The Eve and its 15 rock songs become true. The main concept is to demonstrate that Rock and Roll is still alive and that there’s a lot of people in the world who can play it very damn good. A bunch of songs, a little bit of briefing, a selection of the best played parts, the supervision of the Italian artist in arrangement and production of an album that promises a very musical melting pot: and the job is done. Here's the reasons of the choice of this brand. The Eve is like to be ready and prepared for something: the eve of a change, in the world, in the music, in the concept of a band itself. The Eve is a vision for a brand-new future, a way that we can and must describe with our values and ideas. A new name should be able, indeed, to evocate something new and Alessandro is so sure of this choice that he decided to adopt this name himself, not only for the new album. Therefore, he will promote his new work with a new name, The Eve, even if the release will be available digitally even under his real name. Fourteen songs, as said, with a clear path: the aim, for the human kind, to be free. Free to choose, where we want to go, who we want to be; free to run straight to something we still don’t own - maybe ourselves? - (Free Man on The Run, I want What's Mine). It’s a struggle to that freedom (The Battle Is On! ), a freedom somewhat spiritual, which claims for our souls (Listen 2 Your Heart, Something 2 Believe); a struggle to defeat the human fears (Candies from the Strangers, Don’t Back Down, We live in Danger, Come Undone). A freedom that only can be found in an insane unconsciousness (Where Am I Going Now, The Way I do) or in the love for somebody (My Breakaway). A prayer for a human redemption from the hard lives we’re often caged within (New Millennium prayer, with some Lennon’s reminiscences). It’s not a political work, though his social and ethical facets give this project a sense of mature values, typical for a concept album, the way we were used to in the Seventies. 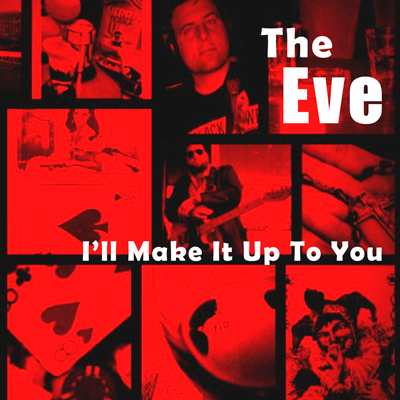 This is The Eve: a record, a band, a project, a vision. The waiting for a new human awareness of the world we want to build, for the people we decide to be. The Eve will be available worldwide for digital download June, 7, 2019 on all the main e-music stores (iTunes, Apple Music, Amazon Music etc.) and in streaming on Spotify and Lonely Oak Radio as well. "I'll Make it Up to You" is an extra bonus single and it won't be available on the new record. It will be officially release April, 5. The followers of www.theEveband.com can buy it right now and they will receive as a gift the official digital booklet of the album itself featuring lyrics and pics. The second single is "Candles From the Strangers" and it will be released May, 5 2019. Bio: Singer / songwriter / musician / writer from Rome, Italy Alessandro started his musical career as Alex Baggi in 1995, with an Italian band and a rock project named "Un po' di sentimento". He says: "I wanted to be a R 'n' R star and so I bought my first guitar at 13 years, like The Byrds suggested". He thinks about his music as free and independent from any marketing or mode constrictions, writing and playing just the music he loves: hard rock, classic rock, funk rock, country rock. His musical production may be considered a little bit "versatile", for the musical genres it represents but the artist says that that is the core strength of his music, so far to be identified by just one musical style. Notes for the artist: This page will always be here under your name in "Featured Artists" You can always send us an updated Bio using 'CONTACT' on Menu at the top of page.